It seems that good migration days are not unlike buses - you wait an age for one to come along, then two come along together! Not that we are complaining of course; this weekend has been a real Cape May classic and what is really interesting are the differences. While Saturday was pretty much all about warblers, Sunday had a real hint of October about it and, of course, that month is only just around the corner. This morning at Higbee Beach was all about woodpeckers - an impressive flight of Northern Flickers swarmed through the trees and in the air space above and with them came a smaller, though equally impressive, number of Red-bellied Woodpeckers. As the light kept across the sky, warblers became the focus of attention again, though this time there was a great wodge of Palm warblers moving through, along with a fair scattering of Yellow-rumped Warblers. At least two Orange-crowned Warblers were reported from the third field and the counters on the dike came up with an impressive seven Connecticut Warblers! Ruby-crowned Kinglets were in far greater numb er than I had noticed yesterday and one or two Golden-crowned Kinglets were calling from the bushes around the parking lot. Cedar Waxwings, Yellow-bellied Sapsuckers, Chipping, Song and White-throated Sparrows and plenty of Eastern Phoebes were all 'late season' birds, but there were 'mid season' birds still around too - Yellow-billed Cuckoo, Scarlet Tanager, Yellow-bellied Flycatcher - and a Northern Rough-winged Swallow later at the state park. Thrushes lurked in the undergrowth and, as usual dropped in before it was light, thus cleverly avoiding being counted at Higbee dike, but local bird banders reported a good run of Gray-cheeked and Swainson's Thrushes and a highlight was the discovery of a Bicknell's Thrush, which very obligingly showed all the right identification features for the species - that doesn't always happen! Perhaps most surprising among all this wonderful activity was the presence of several Purple Finches and Pine Siskins which were clearly already heading southward - not excessively early, but interesting nevertheless and perhaps a sign of a food shortage further north. As so often happens, it's the second day of a north-west front that produces the icing on the cake and for many visiting as well as resident birders, Sunday's highlight was the perky Say's Phoebe that fed actively around the fire heap and even on the roof of Cape May's famous bunker. The amazing pulling power of the aphids on the Siberian Elms continues to wow Cape May birders, as well as providing hungry migrants with plenty of food. 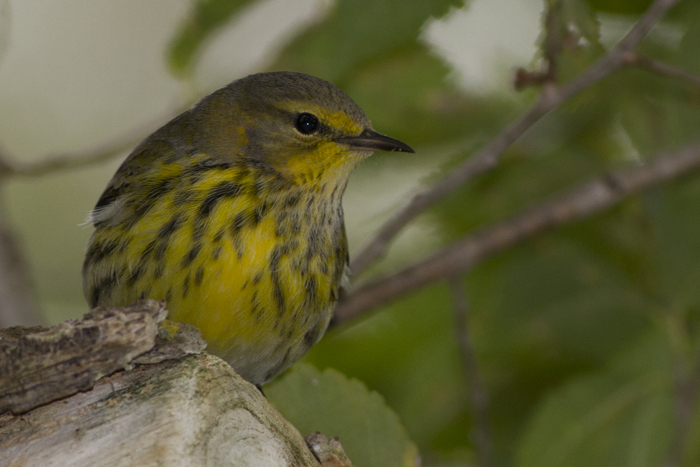 This Cape May Warbler was enjoying the feast at Cape May Point on Saturday [photo by Sam Galick]. A juvenile/female Black-throated Blue Warbler - one of many moving through the point this weekend [photo by Sam Galick]. Search among the lichen-covered elm branches and you will find less common treats among the wealth of warbler delights. Tennessee Warblers don't share the gaudy black and yellow designs of many of the other wood-warblers, but have a mossy attractiveness all of their own [photo by Sam Galick]. Subtlety personified - a Bicknell's Thrush in the hand saves a tortuous walk up Slide Mountain! Note the slightly warmer tone to the primary and tail edges and - especially - the primary coverts. 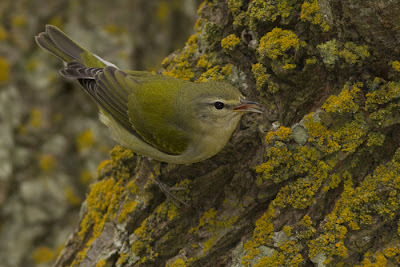 Note also the subtly short-tailed look, the small bill and the overall compact feel of the bird [photo by Mike Crewe]. For comparison with the bird above, here's a Gray-cheeked Thrush, showing an overall colder gray-brown color, grayer cheeks, relatively larger bill and a generally chunkier, larger feel to the bird. The slightly longer tail and longer primary projection were evident at the time but cannot be judged here [photo by Mike Crewe]. A late hanger-on - this Yellow-bellied Flycatcher was at Higbee Beach today (Sep. 30th), along with a good number of Eastern Wood Pewees and Eastern Phoebes. 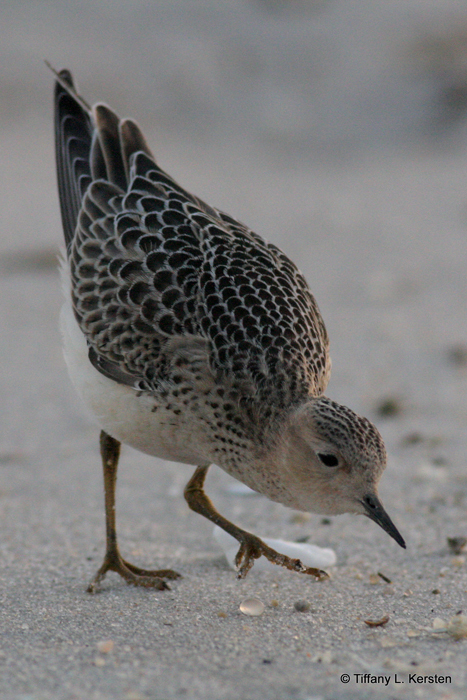 Sibley's Birds of Cape May gives October 1st as a latest date for this species so keep you eyes peeled. Note the strong greenish cast to the upperparts, the rather large-headed look and the yellow wash to the throat and eyering [photo by Mike Crewe]. Say's Phoebe on the beach bunker, Cape May Point State Park [photo by Mike Crewe]. Say's Phoebe on the bunker. Note the gray upperparts, white fringes to the tertials, contrasting black tail and salmon-washed underparts [photo by Mike Crewe]. Say's Phoebes in flight look overall pale with a white underwing and with a contrasting black tail [photo by Sam Galick]. 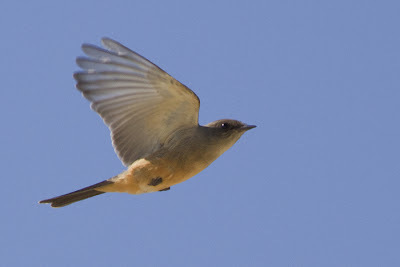 Say's Phoebe flying over the dunes, Cape May Point State Park. 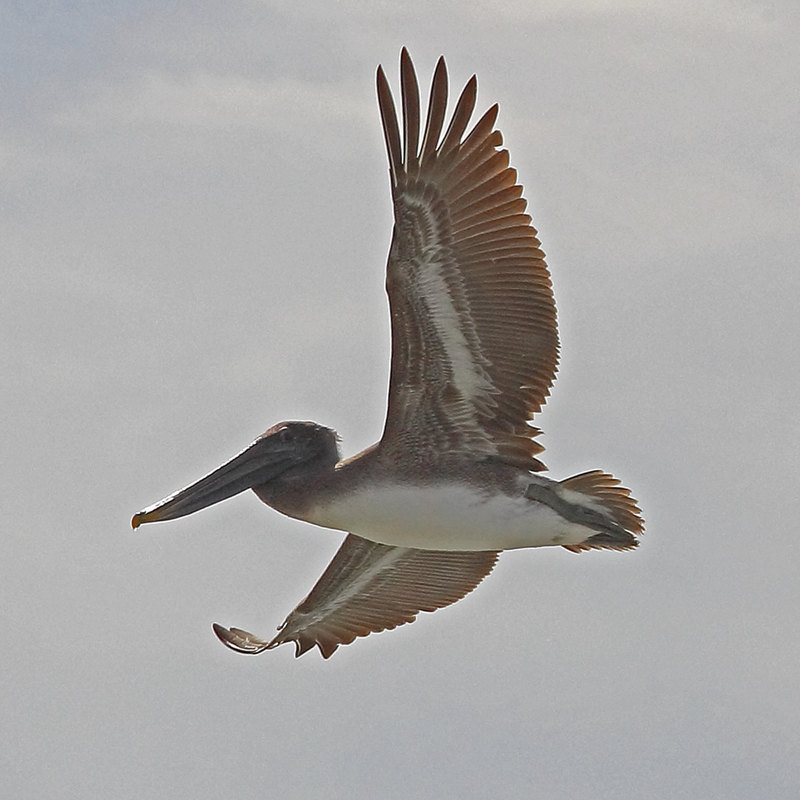 Note the rather long wings and full tail - typical phoebe features [photo by Mike Crewe]. Warblers, warblers and, oh yes, warblers!! I'm not a keen one for predicting flights at Cape May - there are just too many variables for us to be able to do that, but you have to admit, I did suggest you should be at Higbee Beach today! After Cameron almost died of boredom yesterday with just 13 birds at the dike flight, today was a very different story. Keeping up with the amazing warbler flight was pretty tough going, but Cameron's guestimate of some 2500-3000 Blackpoll Warblers, in a flight of over 4400 warblers, gives a good idea of just what was in store for today's lucky birdwatchers at the point. Given that all the birds counted by Cameron headed northward off the island, the large number of warblers left around the streets of Cape May Point must surely have been additional to the dike flight birds and adding another thousand or two to the Higbee total would perhaps give a better indication of what was here to be enjoyed. Every flight is slightly different so you have to run the circuit of all the regular locations to check just where the best bird gatherings are taking place. I heard later that the state park cedar stands were rather quiet, but the Northwood Center front yard seemed to be pretty busy, so I headed out around Lake Lily to see what else was out there for folks to enjoy. My route eventually found me at Bill and Edie Schul's famous 'Magic Tree' on the corner of Cambridge and Coral Avenues. This tree is a large Siberian Elm, a species with deeply fissured bark, and it is in these fissures that certain species of aphid hole up in great numbers to hibernate. Today, this tree was magic indeed as warblers hopped about all over it - at one point, seven Blackpoll, one Black-and-white and two Pine Warblers, and two Red-breasted Nuthatches were busy feeding on a single branch! Tennessee, Nashville and Cape May Warblers were here too, as well as Ruby-throated Hummingbird and one of several Eastern Wood Pewees seen today. Other Siberian Elms around the point were excelling themselves in a similar way, including those that hang right across the road at the north end of East Lake Drive. Tearing eyes away from the trees was not easy, but it was necessary periodically, so as to enjoy the raptor flight that was also taking place overhead. Not a huge or dramatic flight, but a steady stream of nice birds - at one point, a Bald Eagle and a Peregrine were sharing air space, on another occasion, a Northern Harrier and a Broad-winged Hawk did a left and right on me. Pete Dunne's Falcon Fest workshop certainly seemed to be having a great time when I stopped by the Hawkwatch Platform later, with American Kestrels and Merlins sharing the airspace and tucking into dragonfly lunches. Perhaps the most interesting movement today involved Belted Kingfishers, with 25 or more logged passing the Hawkwatch Platform today. An awesome today and - well, fingers crossed, but tomorrow is looking promising too - see you in the field!!! A great start to the day - a Swainson's Thrush peeps out from the depths of a red cedar at Higbee Beach. Both Swainson's Thrushes and Veeries were around first thing this morning at several sites [photo by Mike Crewe]. One at a time now! A small Wild Turkey population is developing along New England Road - good news for attempts to keep ticks at bay as these guys love to eat them [photo by Mike Crewe]. Seagrove Avenue this morning - the only place to be for a real warbler treat [photo by Mike Crewe]. It's not just turkeys that need to cross the road! A Northern Waterthrush struts out from under a parked car - just one of three that were lurking there at one point... [photo by Mike Crewe]. Blue Jays and Northern Flickers have been very noticeable over the past 24 hours or so, with busy groups of these common - but still great to look at - birds passing through our airspace. This morning at Higbee Beach, 30 flickers were in the air at one time, no doubt stirred up by the male Cooper's Hawk that was patrolling the field edges. Yesterday morning, it was the turn of Blue Jays, with Tom Reed counting over 400 passing the Hawkwatch Platform, and several of the local birders were counting the same birds as they spun around Cape May Point and competed with a good movement of Monarchs for our attention. Busy migration mornings at Cape May are not guaranteed and sometimes they can catch us unawares; Thursday morning was one of those days, as Merlins came in off the bay carrying unfortunate Blackpoll Warblers that were caught out over the water at first light, Parasitic Jaegers harassed the local terns in the rips (at one time, three jaegers were chasing the same tern!) and Monarchs fluttered by in little strings of four or five individuals. If you are here at Cape May and finding it quiet at the point, there are still plenty of good birds around Stone Harbor/Nummy's Island (Red Knot, Marbled Godwit, Piping Plover, Black-crowned and Yellow-crowned Night Herons, Tricolored Heron) and Cox Hall Creek WMA (Eastern Bluebirds and plenty of warbler opportunities) as well as Horned Larks and American Kestrels at the airport and good chances for American Bittern or Sora at The Meadows in the evenings. Don't forget the great Black Skimmer show at 2nd Avenue jetty too! The weather continues hard to predict, but, if the weather plays fair, we could have a nice run of birds Saturday morning. North-west winds are predicted from the middle of the night onward, which should bring us some birds - so what's the hitch? 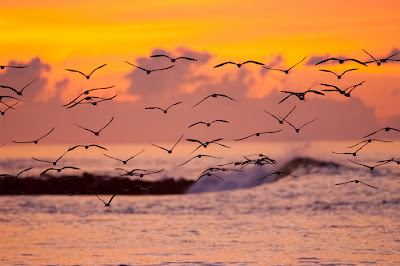 Well, to predict local bird movements, you really have to look further afield; remember that the weather at the bird's point of departure and during their onward journey through the night has to be right. Looking at the broader picture, there is a band of rain currently making its way across the country from the south-west. If that passes to the north of us during the night, it will bring the birds down and they won't make it to Cape May - at least not on Saturday. Still, let's be optimistic - birds will be moving tonight, there is no doubt of that so let's put a little voodoo on that weather pattern and keep it west of us, where it belongs (sorry Pennsylvania!!). See you at Higbee's tomorrow! 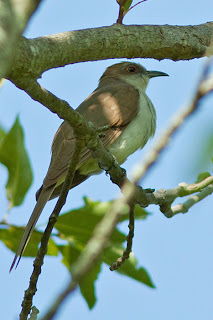 Though Yellow-billed Cuckoos have been easy enough to find, Black-billed Cuckoos have been very thin on the ground this year. This bird was photographed at Higbee Beach on September 7th [photo by Johan Wallender]. It always pays to keep an eye out for banded birds, especially those wearing color marks which are easier to see in the field. This Common term was photographed at Cape May Point by Linda Widdop and appears to be part of a banding scheme taking place in Argentina - you never know where your birds are going!! If you do see a banded or color-marked bird, please do take time to report it, as all such schemes rely on the reporting of birds so that information can be gained on their movements. 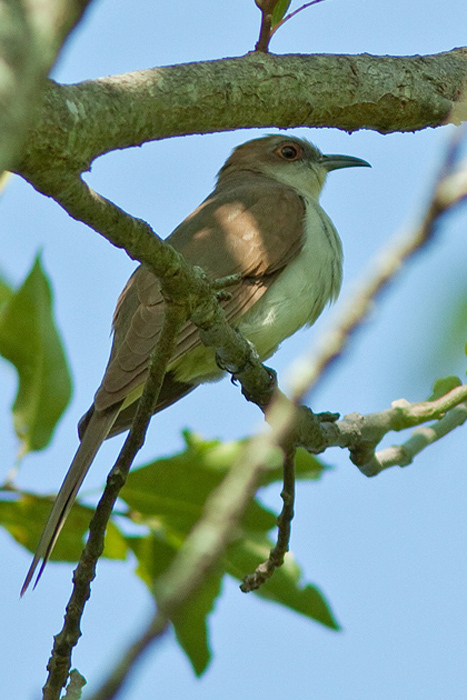 To report a bird, go to http://www.pwrc.usgs.gov/bbl/ and follow the instructions. Ahhh, sparrows! They are really great little birds, but oh so infuriating! This Clay-colored Sparrow has delighted visitors for ten days or so at the state park brush pile just west of the plover ponds. It's really worth putting in the time to get to know sparrows better and you will find them not as tough as you might at first think. Our Sparrows workshop is a wonderful way to get to grips with these smart little birds - find out details from our Program Registrar on 609-861-0700 [photo by Karl Lukens]. Finally, don't forget Cape May's 'Top End' during late September as it still has many treats awaiting your discovery. This wonderful stand of Pine-barren Gentian was a real highlight for me last Monday morning on a late-season Belleplain visit [photo by Mike Crewe]. If you are visiting Cape May from abroad, you might like to try finding a few Wild Turkeys while you are here. These birds are on the increase in our area and an early morning drive in the north of the county will often provide you with nice views of these chunky birds. This group is a part of some 20 birds that were near Petersburg last Monday [photo by Mike Crewe]. Butterflies continue to be in the news as southerly airflows push more and more exciting species into our area. This Clouded Skipper was found by Chris Tonkinson on the CMBO butterfly walk at the state park last Sunday. This species, as well as Ocola Skipper and the more imposing Brazilian Skipper, are all being reported around the county right now [photo by Mike Crewe]. This is the Cape May Birding Hotline, a service of New Jersey Audubon's Cape May Bird Observatory. This week's message was prepared on Thursday, September 27, 2012. Included this week are sightings of COMMON EIDER, GREAT SHEARWATER, SWAINSON'S HAWK, SORA, COMMON GALLINULE, BLACK TERN, PARASITIC JAEGER, EURASIAN COLLARED-DOVE, RED-HEADED WOODPECKER, NORTHERN FLICKER, PURPLE MARTIN, RED-BREASTED NUTHATCH, WINTER WREN, CONNECTICUT WARBLER, BAY-BREASTED WARBLER, YELLOW-THROATED WARBLER, WILSON'S WARBLER, CLAY-COLORED SPARROW, LINCOLN'S SPARROW, SCARLET TANAGER, PURPLE FINCH and PINE SISKIN. A juvenile SWAINSON'S HAWK was briefly viewed from the Cape May Hawk Watch on 9/25, last seen flying north. Two late PURPLE MARTINS were seen over Cape May Point on 9/27, a RED-HEADED WOODPECKER flew past the Hawk Watch on 9/23, and at least one COMMON GALLINULE has been on Bunker Pond for most of the week. SORAS have been heard at Cape May Point State Park in recent days. 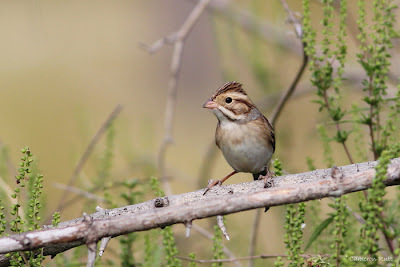 A CLAY-COLORED SPARROW continued in the area of the brush pile at Cape May Point State Park through 9/26 and was found along the dune path, along the south edge of Bunker Pond, on 9/27. A LINCOLN'S SPARROW was found at the brush pile on 9/26. 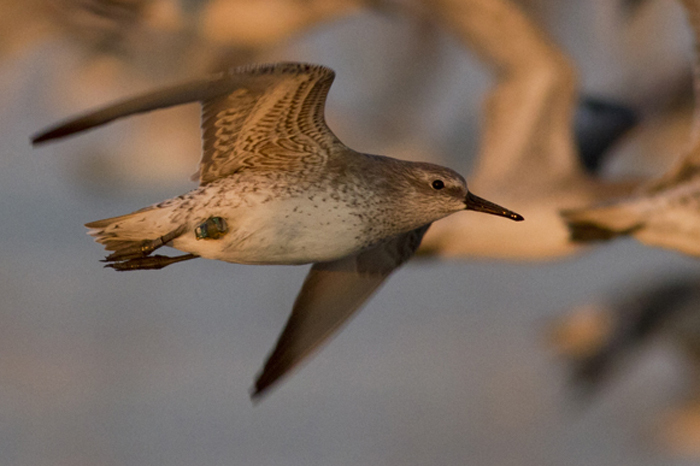 A GREAT SHEARWATER was reported from St. Mary's in Cape May Point on 9/23. 2 BLACK TERNS were noted offshore Cape May Point on 9/23 on 9/26, while as many as 5 PARASITIC JAEGERS could be found off the Point throughout most of the week. A COMMON EIDER was seen from the Avalon Seawatch on 9/23. 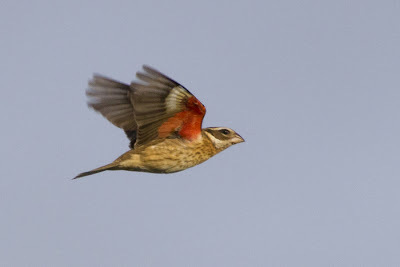 An excellent songbird flight on 9/24 brought several thousand birds past the Higbee Dike, including 3 CONNECTICUT WARBLERS, 744 NORTHERN FLICKERS, 25 SCARLET TANAGERS and a WILSON'S WARBLER. Warblers were also very much in evidence around Cape May Point that day, with 2 YELLOW-THROATED WARBLERS and BAY-BREASTED WARBLER as highlights. RED-BREASTED NUTHATCHES continued to inundate Cape May this week, with smaller numbers of PURPLE FINCH reports. The season's first PINE SISKIN flew past the Avalon Seawatch on 9/24, while the first WINTER WREN was at CMBO's Northwood Center on 9/26. Finally, Cape May Point's resident EURASIAN COLLARED-DOVES continue to show regularly in the area of Lincoln, Whildin and Harvard Avenues. The topsy turvy world of migration continues to confuse and confound us as each day delivers us a completely new set of surprises. The week continues as before, with up days followed by down days and the only thing I can suggest is, if you're not out there, you're going to miss something! 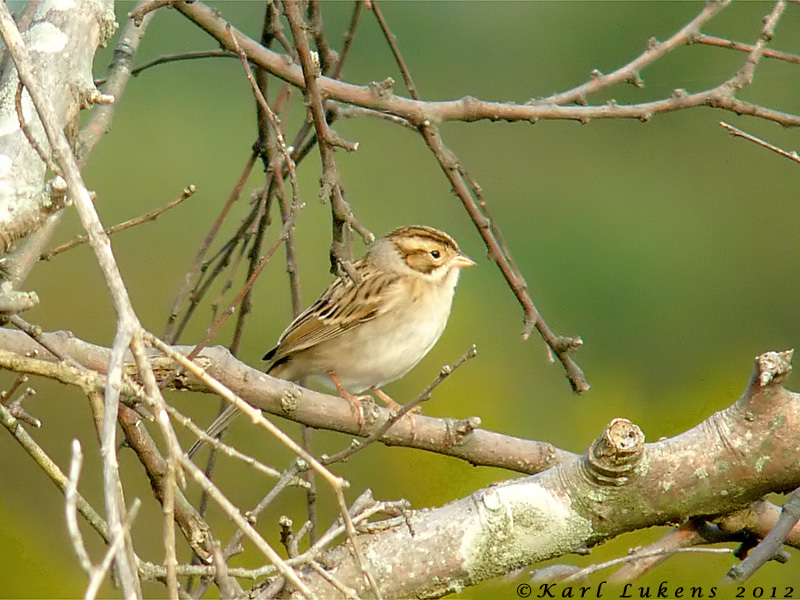 The Clay-colored Sparrow remained right through today in the brush pile on the south side of Bunker Pond; our Wednesday morning walk group found it without difficulty - and added a Lincoln's Sparrow in the same pile of sticks too! Palm Warblers and Common Yellowthroats are still plentiful along the dune edge and a Dickcissel was reported from the main dune crossover at the park. The fall of birds that rushed through Higbee Beach oh so quickly on Monday morning did produce some nice finds later in the day, including at least one Connecticut Warbler in the second field at Higbee Beach and a really eventful afternoon down at Cape May Point with a good range of warblers reported, including at least two of the albilora race of Yellow-throated Warbler - a notably late date for this species. The 25th was a little slower getting going but the middle of the day provided a Cliff Swallow over Bunker Pond and then a report of a Swainson's Hawk, which sadly didn't loiter. A Red-headed Woodpecker was reported by one observer at the Northwood Center - a very good bird indeed for the store list - and there was a whisper of a male Yellow-headed Blackbird at Cox Hall Creek WMA, but no other details on location. This morning started well for Steve Glynn, who reported at least two, maybe three, Parasitic Jaegers in The Rips, as well as a possible Pomarine Jaeger with them. Finally an early Winter Wren was seen at the Northwood Center today - a relatively early date for the species but the dark, overgrown ivy thickets at the store are a regular location for this species. Duck numbers grow slowly at Bunker Pond (which seems to be favored over Lighthouse Pond so far this year) and at least six Pied-billed Grebes were there this morning. A Common Gallinule (or American Moorhen if you prefer) was on Lighthouse Pond East on both the 25th and 26th, though it can be very elusive in the cattails on the north side. This last location provided an excellent raptor show first thing this morning with Cooper's and Sharp-shinned Hawks, Merlin and a Peregrine all making a play for a flicker breakfast! Slow but sure has been the order of the day for migrants over the last few days. Glimmers of hope lie in the hope of cold fronts and North-west winds lurking on the horizon, only to have them dashed by belts of wet weather to the north of us which grounds any migrants that might be heading our way. Predicting the occurence of good falls of birds at Higbee Beach remains a real hit and miss affair with so many variables being thrown into the equation. Today did bear quite a few signs of being a busy day for birdwatchers, but things were quieter than had been hoped. Nevertheless, there was a nice run of Blackpoll Warblers this morning and good numbers of Black-and-white Warblers, Northern Parulas and Red-eyed Vireos continue to filter through. Keep an eye out for Red-breasted Nuthatches around Cape May too as they are still moving through at the moment. Unexpected treats included a Yellow-throated Warbler on the red trail in Cape May Point State Park and a Stilt Sandpiper on Bunker Pond. A good falcon flight took place today with Peregrines giving a particularly good show over Lake Lily this morning and a steady procession of American Kestrels and Merlins passing the Hawkwatch Platform this afternoon. Parasitic Jaegers are being seen fairly frequently in The Rips now and Steve Glynn reported a Great Shearwater off St. Mary's early morning. The Seawatch started this weekend, so do please drop by at the north end of Avalon if you have a chance and see what's passing offshore - daily totals will be posted on our Seasonal Research page. Vince Elia got things going well there today with an early Common Eider. Today didn't quite perform as well it might for birds, but our six-legged friends continue to draw the crowds. Monarch migration is in full swing now and both dragonflies and butterflies continue to provide much to look at. Michael O'Brien reported four species of saddlebags at the point today (Carolina, Black, Red and Striped) while Will Kerling found a very obliging Clouded Skipper which remained in one small area on the red trail in the state park long enough for several people to catch up with this species, which seems to be rarer now in Cape May than it was a few years ago. Among a wonderful array of southern and western butterfly species being recorded in Cape May at the moment, perhaps the most unusual in appearance is the Long-tailed Skipper. This species is readily recognized by its long hindwing extensions and is currently being reported from all over the county [photo by Sam Galick]. Red Knot are present at Stone Harbor Point in good numbers right now. If you go looking for them, check carefully for any banded birds as reports of these all help to further our knowledge of this global traveller. 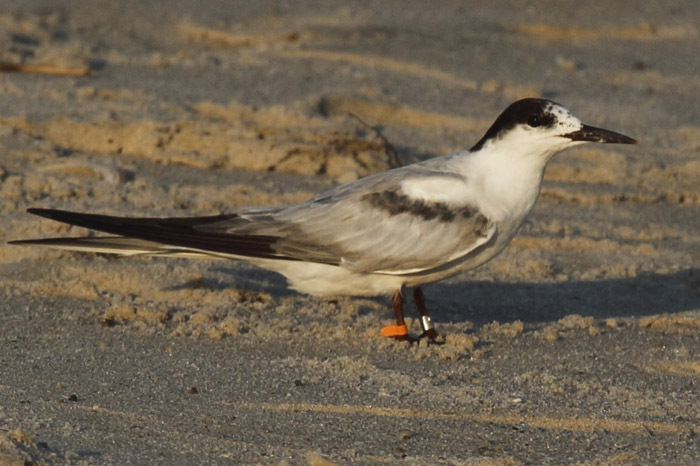 This bird is carrying a geolocator datalogger, a device which collects and stores details of the bird's whereabouts, which can be downloaded and analyzed at a later date [photo by Sam Galick]. This bird skulked in bayberry bushes beside Bunker Pond in Cape May Point State Park on Saturday and set a few discussions going. It appears to show many of the features of Audubon's Warbler - the Western race of Yellow-rumped Warbler - but there are perhaps one or two anomalies in the plumage and the jury is still out as to whether it can be considered a true Audubon's, or whether it is perhaps an intergrade or hybrid between the Eastern and Western populations. Note the yellow wash to the small, pale throat area which favors Audubon's, but the suggestion of a supercilium and one or two other, weaker, features are rather ambiguous [photo by Tom Reed]. This is the Cape May Birding Hotline, a service of New Jersey Audubon's Cape May Bird Observatory. This week's message was prepared on Thursday, September 20, 2012. Included this week are sightings of WHITE-WINGED SCOTER, AMERICAN GOLDEN-PLOVER, BUFF-BREASTED SANDPIPER, GULL-BILLED TERN, BLACK TERN, PARASITIC JAEGER, EURASIAN COLLARED-DOVE, COMMON NIGHTHAWK, RED-HEADED WOODPECKER, RED-BREASTED NUTHATCH, BROWN CREEPER, TENNESSEE WARBLER, CONNECTICUT WARBLER, BAY-BREASTED WARBLER, CLAY-COLORED SPARROW, SUMMER TANAGER and PURPLE FINCH. A CLAY-COLORED SPARROW spent time near the brush pile along the dune path at Cape May Point State Park from 9/16-17. Another CLAY-COLORED SPARROW was seen at Armacost Park in Avalon on 9/14. At least one BUFF-BREASTED SANDPIPER was seen at Cape May Point State Park and the South Cape May Meadows on 9/15 and 9/16. An AMERICAN GOLDEN-PLOVER flew past the Cape May Hawk Watch on 9/15. A GULL-BILLED TERN lingered around Cape May Point through at least 9/19. A BLACK TERN was seen on Bunker Pond (Cape May Point State Park) on 9/18. At least 2-3 PARASITIC JAEGERS have been present in "the rips" off Cape May Point since 9/18. An unseasonal WHITE-WINGED SCOTER continued in Cape May Harbor this week. COMMON NIGHTHAWKS have been noted on most recent evenings at Cape May Point, with as many as 30 present over the South Cape May Meadows on 9/15. Highlights from the Higbee Dike this week included RED-HEADED WOODPECKERS on multiple days, 23 TENNESSEE WARBLERS and 2 BAY-BREASTED WARBLERS on 9/17, 3 SUMMER TANAGERS on 9/16, and CONNECTICUT WARBLERS on multiple days. CONNECTICUT WARBLERS were also noted from the Higbee fields and at Cape May Point State Park this week. PURPLE FINCHES and RED-BREASTED NUTHATCHES continue on a daily basis around Cape Island, with 85 nuthatches counted from the Higbee Dike on 9/20. The season's first BROWN CREEPER was found in West Cape May on 9/19. 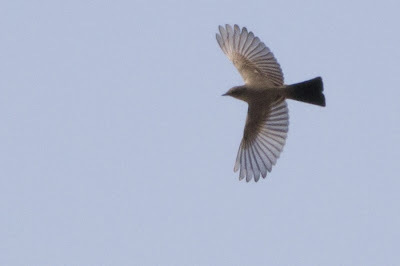 Migration this past few days has been hard to sum up, as variable and somewhat unpredictable weather keeps us guessing. Night that look ideal for a good movement, while more mediocre conditions have produced some interesting flurries of activity. All I can say is - it's September, get down to Cape May whenever you can! Last Sunday morning and today (Thursday) have so far provided the best small falls of bird movements through Higbee Beach. To keep a daily eye on these, don't forget to visit our Seasonal Research page, where Cameron Rutt is doing an excellent job posting the Morning Flight counts and analyzing data. Tom Reed is also posting sightings from the Hawkwatch Platform there on a daily basis, so there should be plenty for you to read as we keep you updated on all the wonderful bird movements through Cape May. Yesterday, I had 12 Common Nighthawks flying over my house around 6:15PM while 20 or more were apparently over the state park around the same time, so the remarkable fall for that species continues. One or two other less-than-usual sightings of late included a Hooded Warbler that Richard Crossley reported to me in the third field at Higbee Beach today and that site also had a nice movement of Red-breasted Nuthatches again this morning, as well as Nashville Warbler, Rose-breasted Grosbeak and good numbers of Cedar Waxwings, Red-eyed Vireos, Common Yellowthroats, Indigo Buntings and Northern Parulas. There also seemed to be a first push of Red-bellied Woodpeckers among the more numerous Northern Flickers. One bird I would ask anyone visiting the back bays to keep an eye out for is Reddish Egret. Some visiting friends from the UK reported one from the south side of Avalon Boulevard a few days ago and, as this would be a first record for Cape May County, it would be great if someone could re-find this bird and grab a photograph! There's plenty of places to look - Nummy's Island, Shell Bay Landing, Benny's Landing or any of the boulevards that cross the back bays to the barrier islands. The bird was reported as an adult with full head plumes. Last week I posted phone pictures of the Red Saddlebags that was at Higbee Beach. Just for the record, here's a much better photo taken by walk participant Dave Romea. I haven't seen this beastie again since then, but do keep an eye out for this Cape May rarity. 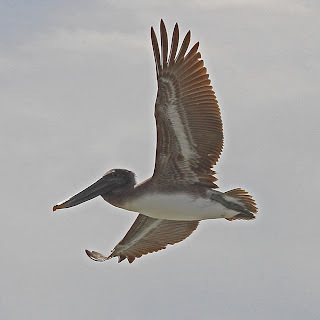 It's been a bumper year for Brown Pelicans around Cape May and small parties may still be seen around Cape May Point or up around Hereford Inlet. This fine portrait was captured by E J Nistico at Longport Island. 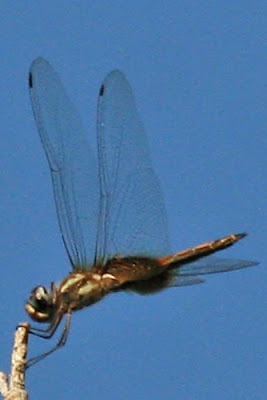 Dragonflies continue to be a major migration feature at Cape May right now. As well as large numbers of various saddlebags and gliders, Swamp Darners (above) are easily seen right now - though you have to be lucky to get one settled and posing for a shot [photo by Kevin Inman]. All you keen butterfly watchers will be pleased to know that Monarch migration is now in full swing. Variable weather means that roosts are forming and breaking up quickly and so far we have not had the right conditions to produce an epic flight. However, some 600 Monarchs were on Stites Avenue in Cape May Point last night and there could be good numbers around over this coming weekend. For regular updates, check out the Monarch Monitoring Project blog site [photo by Kevin Inman]. Always be ready for the unexpected in Cape May! I was sent this picture by Jon McRay of a bird that could easily be mistaken for a Glaucous Gull (left), but which Jon correctly surmised is a Great Black-backed Gull. 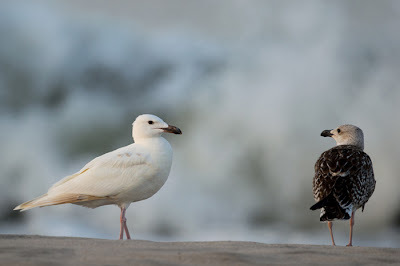 The dark bill and eye mean that technically this is not an albino but what is termed a leucistic individual, with greatly reduced color pigment in its feathers. Compare size and structure with the 'regular' Great Black-back on the right. This Clay-colored Sparrow recently spent a few days around the brush pile near the south-east corner of Bunker Pond and showed very well at times. Note the rather pale face, caused by the lack of a dark line between the bill and eye - a feature that nicely identifies it from Chipping Sparrow [photo by Cameron Rutt]. Buff-breasted Sandpipers are so wonderful that they instantly create great photo opportunities. Tiffany Kersten caught this wonderful image on South Cape May Beach recently - and it can only be in Cape May, since there's a Cape May diamond right at its feet! Sometimes you can create wonderfully artistic images simply by having a photo that isn't pin-sharp, but which creates the impression of movement. 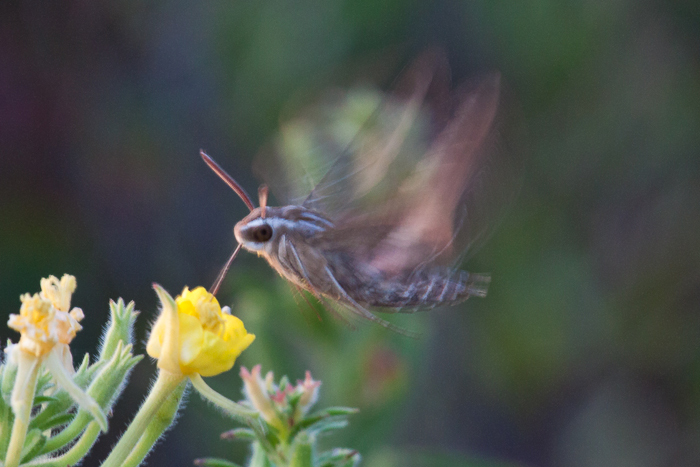 Low light levels create slower shutter speeds and I really like this image of a White-lined Sphinx sipping from evening-primrose at Stone Harbor [photo by Mike Newlon]. OK, OK, so finishing on a sunset is cheezy!! But isn't a Cape May sunset the very best backdrop for a flock of Black Skimmers?! Check out the beach in front of Second and Beach Avenues for some great photo opportunities in the evening [photo by Jon McRay]. 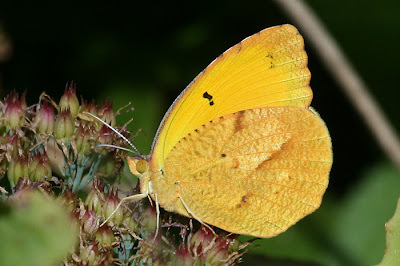 It's not often that there are enough Cloudless Sulphurs around to start looking for their crysalises, but we are now finding lots of these yellowish, papery, empty cases all over Cape May [photo by Mike Crewe]. To really be amazed at the beauty of Cloudless Sulphurs, however, you need to find a living chrysalis, before the adult butterfly has emerged. This fabulous pink 'dead leaf'' was photographed in Pat Sutton's wildlife garden [photo by Mike Crewe]. Little Yellows have been a real revelation this year; this southern species, that historically has had periodic ups and downs in populations at Cape May Point, has been seen throughout Cape May County, so it has been a good time to look for more than just the butterflies. Here, a freshly-emerged adult dries its wings, while its empty chrysalis case can be seen down at lower left [photo by Mike Crewe]. If you are looking at the yellows and sulphurs and trying to work out the different species, don't forget to keep in mind Sleepy Orange. With all the other great butterfly species turning up this year, it is perhaps surprising that there hasn't been more Sleepy Oranges around, but there is still time to get your eye in and find one of these attractive insects [photo by Mike Crewe]. Perhaps the 'Grand Prize' of southern butterflies in Cape May, this Giant Swallowtail in Villas on September 13th was one of at least three to have been reported in the county so far this year. This is a good one to keep an eye out for over the next month or so - note the pattern of yellow spots on the black background on the upperside [photo by Mike Crewe]. From below, Giant Swallowtails are predominantly yellow, unlike our more regular dark swallowtail species [photo by Mike Crewe]. Not so much a looker as the Giant Swallowtail, the Ocola Skipper is a less than annual visitor to Cape May, but this year there are unusually high numbers around Cape May Point. Note the relatively long, narrow shape and the overall dark brown coloration. 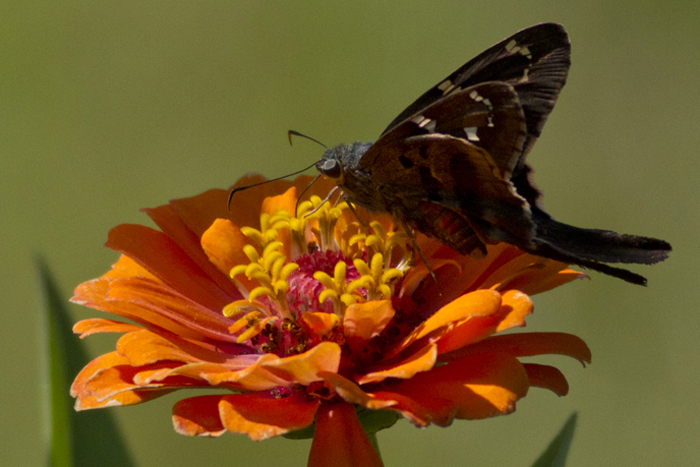 Check out flowering patches of Butterfly Bush, Lantana or Zinnia [photo by Mike Crewe]. Another choice butterfly from the south that has arrived in much higher than average numbers this year, the amazing-looking Long-tailed Skipper is showing up throughout the county right now, with some double-figure counts coming from Cape May Point surveys. The blue-green color seen here is not always obvious, especially from below, so it is best to look for the distinctive long 'tails' [photo by Mike Crewe]. Here's the best my phone could do - mmm, wonderful color rendition!!! Leaving that aside, all the 'saddlebag' features and the details of the black abdominal spots can be seen here [photo by Mike Crewe]. Much higher marks for the iphone! Note all the salient features of Red Saddlebags here as mentioned before. In addition, note that the cerci at the tip of the abdomen are much longer than in Carolina Saddlebags, a feature I had not mentioned before [photo by Lisa Ryan]. This is the Cape May Birding Hotline, a service of New Jersey Audubon's Cape May Bird Observatory. This week's message was prepared on Thursday, September 13, 2012. Included this week are sightings of WHITE-WINGED SCOTER, MAGNIFICENT FRIGATEBIRD, WHIMBREL, MARBLED GODWIT, BUFF-BREASTED SANDPIPER, LEAST TERN, GULL-BILLED TERN, EURASIAN COLLARED-DOVE, OLIVE-SIDED FLYCATCHER, CONNECTICUT WARBLER, MOURNING WARBLER, KENTUCKY WARBLER, LARK SPARROW, DICKCISSEL, and PURPLE FINCH. Bird of the week honors go to the MAGNIFICENT FRIGATEBIRD that was discovered atop a channel marker in Jarvis Sound on 9/7. The bird lingered for most of the morning before vanishing. Recent sightings aboard "The Osprey" from the back bays of Cape May include WHITE-WINGED SCOTER, MARBLED GODWIT and multiple WHIMBREL. An OLIVE-SIDED FLYCATCHER was seen at Cox Hall Creek (Villas) WMA on 9/9. Lingering GULL-BILLED TERN and LEAST TERN were seen at Cape May Point State Park this week. A LARK SPARROW briefly visited the park on 9/7. A BUFF-BREASTED SANDPIPER flew past the Cape May Hawk Watch on 9/12, and 2 DICKCISSELS flew past on 9/13. 3 MOURNING WARBLERS were seen in the fields at Higbee Beach WMA on 9/9. 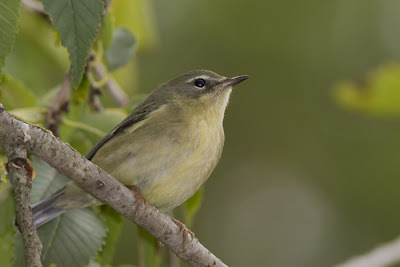 At least one CONNECTICUT WARBLER could be found in the 3rd field at Higbee throughout the week, and the species was also tallied from the Higbee Dike on 9/7 and 9/13. 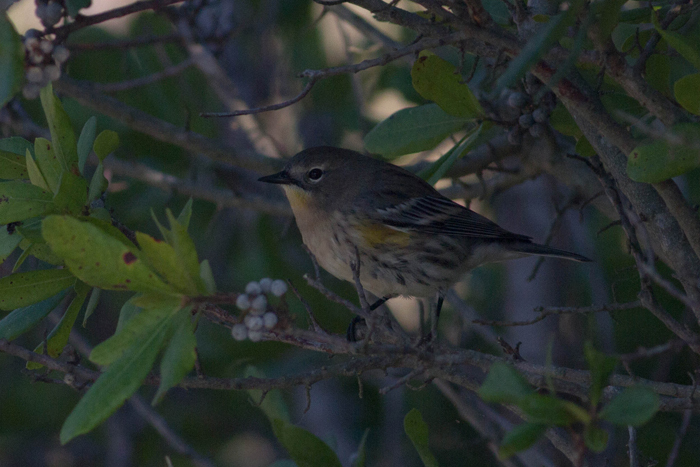 A KENTUCKY WARBLER was at the Dike on 9/10, and PURPLE FINCHES and RED-BREASTED NUTHATCHES continued to be noted there this week. Cape May Point's resident EURASIAN COLLARED-DOVES continue to show regularly in the area of Lincoln, Whildin and Harvard Avenues. 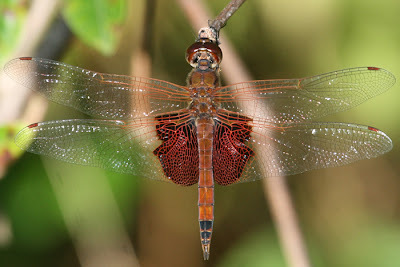 The 'saddlebags' dragonflies are named after the large, colored patches on their wings that bear a passing resemblance to the saddlebags carried on the sides of a horse or a motorbike. The easiest species to identify is the Black Saddlebags, seen here, as it is the only species you will see here that has black rather than red patches on its wings. The body is also extensively black, with yellowish patches toward the end of the abdomen [photo by Mike Crewe]. 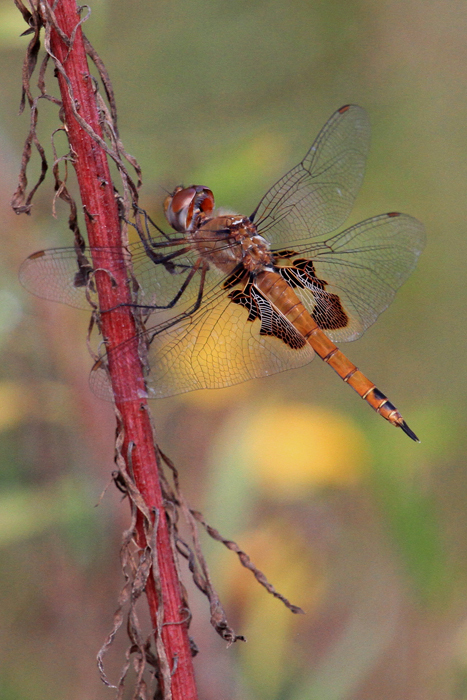 The common and widespread red species around Cape May is Carolina Saddlebags, a regular breeding species with us. You are likely to see this species pretty much anywhere right now. Like most saddlebags species, they hunt for long periods on the wing and, when perching, prefer to sit high up on a tree top, making them often difficult to study closely. To identify this species from above, note the exact shape of the outer edge of the wing patch - the spiked 'tooth' in the middle of this outer edge has an inward notch on the top side of it, but not on the lower side [photo by Mike Crewe]. When viewed from the side, note that the black patches on the abdomen of a Carolina Saddlebags - especially the larger one, furthest from the tip - continue well down the side of the abdomen [photo by Mike Crewe]. Red Saddlebags is a southern species that is a rare vagrant to Cape May, though it could easily be missed amongst the large numbers of Carolinas, so may be a little more common than records suggest. In this typical view from below, note the shape of the outer edge of the dark wing marking. 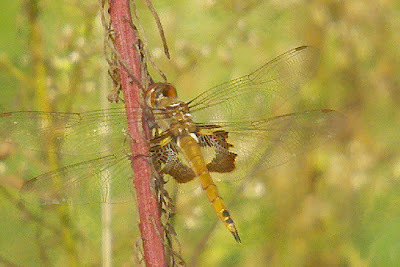 The spiked 'tooth' in the middle of this outer edge has an inward notch on both the top side and the lower side, making it more obvious than on Carolina Saddlebags. Note also the narrow, pale window toward the front edge of the wing patch which is sometimes useful, but not always noticeable [photo by Mike Crewe]. In this side view of a Red Saddlebags, note that the black patches toward the tip of the abdomen do not extend down the sides. Note also the large, triangular, clear window at the base of the wing which extends into the dark wing patch. This feature is also shown by Black Saddlebags but usually not by Carolina Saddlebags. 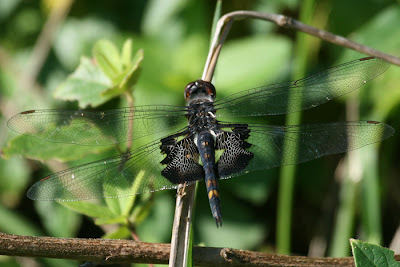 Another vagrant to Cape May (and already reported this year by Michael O'Brien) is Striped Saddlebags, which gets its name from the pale stripes on the sides of the thorax on the female (seen here). Males lack this feature, but both sexes show a very much reduced dark patch at the base of the hindwing, appearing as a stripe with a fairly straight outer edge. 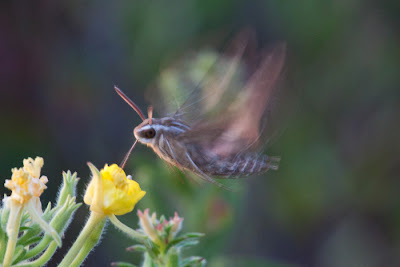 In many ways, this species is much more like the closely-related Spot-winged Glider, which is another common migrant with us [photo by Mike Crewe]. OK, time to get out there and check out those saddlebags! Identifying the red ones can be tricky and often it is best to just take lots of photos and review them later in the comfort of a cosy armchair! ... and the other half may come tomorrow! Hawkwatch - Day 1, the story so far!